THE LOOK of the planned SteelCraft Garden Grove, planned to open on Euclid Street later in 2018 (Studio One Eleven image). 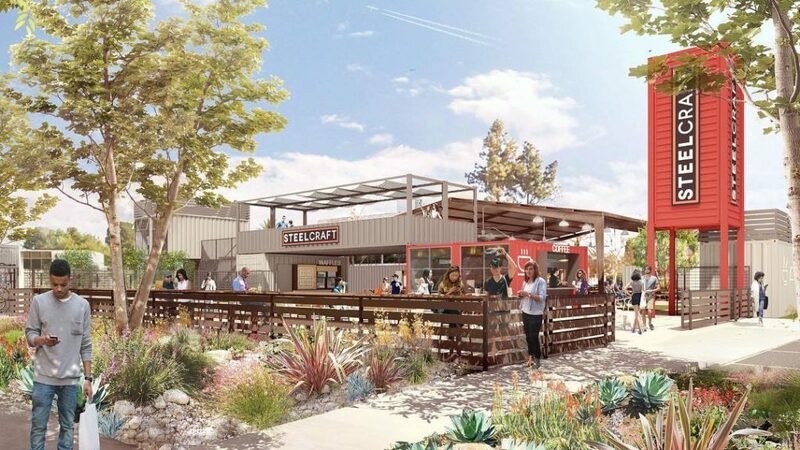 What could be an important step in the renaissance of Garden Grove’s downtown and civic center area will take place on Monday when a groundbreaking ceremony will be held for the SteelCraft outdoor urban eatery. The event will be held from 10 a.m. to noon at 12900 Euclid St., the former site of the Black Angus restaurant. City officials, representatives of the developer – Howard CDM – and some of the tenants-to-be will be on hand. SteelCraft’s Garden Grove version will incorporate some nods to the city’s agricultural past, and offer live music, fund-raising and events. It represents one of the first permanent developments of the city’s plan for an expanded downtown, located in and near Garden Grove’s original central business district, with its origins going back to 1874. Free parking for attendees will be available on the east end of the project site, directly south of City Hall at 11222 Acacia Parkway.